Nobody likes paying tolls, but they are a necessary evil. The money from tolls is used to fund the construction of new roadways, as well as maintenance. Unless you live in one of the 22 states that don't collect tolls, or a state where you can get by without owning a car, you have no other choice but to pony up and pay the toll. 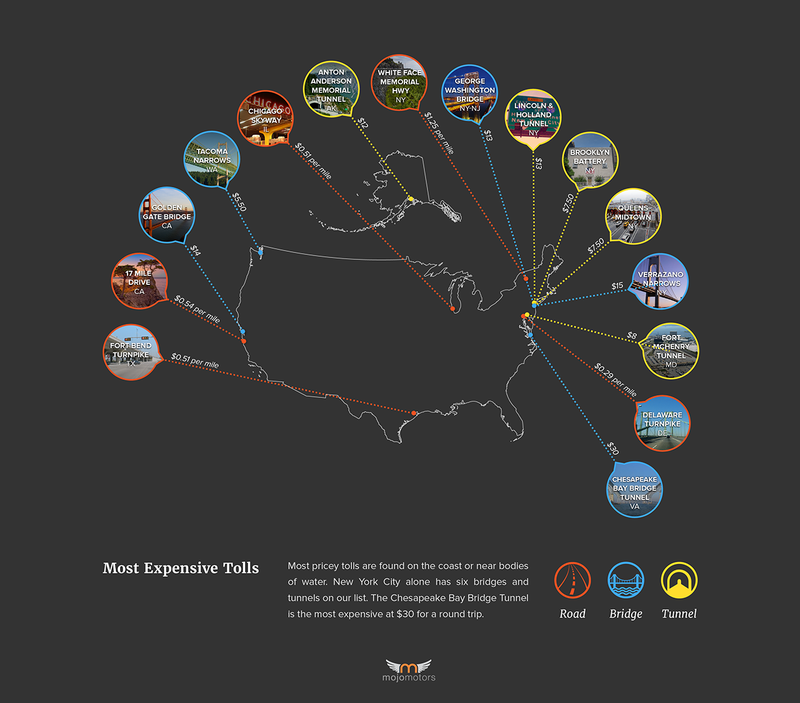 We did some research and found the most expensive tolls in the nation. Most toll roads cost under ten cents per mile, but the price of tolls on a long road trip can add up quickly. At the end of your journey, you could easily spend $50 in tolls…or more if you live in a state with high gas taxes. There are some toll roads you should watch out for and they can add up to as much as $1.25 per mile. The cost is even greater for bridges and tunnels. Hopefully you don't have to pay any of these tolls on your commute. This scenic mountain road only has a 25mph speed limit, so you can really savor every mile. During the summer season, the Whiteface Mountain Memorial Highway will set you back $10 for a 2 Axle vehicle and driver, and $7 for every extra passenger. So if you fill your 8 passenger Honda Odyssey, be prepared to spend $59 for the right to pass. 17 Mile Drive is a scenic road that follows the Pacific coast line in California. This stretch of pavement goes through the gated community of Pebble Beach, and although its free for residents, nonresidents have to pay $10 to enjoy the views. The Chicago Skyway costs only $4, but that is quite a lot for only 7.8 Miles. Starting January 2015, the price of the toll is going up to $4.50, giving the Chicago Skyway a CPM of $.57. Now that's something for Chicagoans to complain about. If you're looking to get from Fresno to Houston, you might consider taking the Fort Bend Parkway, which leads to the Sam Houston Parkway and the downtown Houston area. Be prepared to drop $4 for this short trip of 7.8 miles, including the recent extension. Savvy commuters in Maryland often use parallel roads to shunpike the the Delaware Turnpike, but drivers who don't know better are stuck paying $4 each way to drive the 13.68 mile stretch. That gives the road a CPM of $.29. The Chesapeake Bay-Bridge Tunnel is exactly that, a bridge and a tunnel combined into one structure, but we've included it as a bridge because the distance above ground is much longer than under ground. The 17.6 mile path brings you across the mouth of the Chesapeake Bay while still allowing for shipping channels and sea traffic to enter from the ocean. If you make the round trip within 24 hours, the toll will only cost $18. However, if you wait longer than 24 hours to cross back over the CBBT, you'll be stuck paying a $15 toll each way. You would never know by looking at the current state of Manhattan's roads, but NYC collects some of the highest tolls in the country. The Verrazano Bridge that connects Staten Island with Brooklyn costs $15 one-way, heading into Staten Island. Multiply that by 189,000 cars every day, and you wonder how the MTA could run into a budget deficit of $15 Billion. And there's more bad news for New Yorkers, as the MTA recently announced a 4% toll increase in 2015. Just be glad your car doesn't have 7 Axles, for which the cash toll on the Verrazano is $116. The Golden Gate bridge in San Francisco is famous for many reasons, but one of the more lackluster reasons is the pricey tolls. The $7 toll really adds up for commuters. But we can't say it's not worth it for tourists, as the scenery is breathtaking. Carpoolers with 3 or more people catch a break, getting away with $4 for the toll. Remember "Bridge Gate", the political scandal where staff members under New Jersey's Governor Chris Christie allegedly created traffic jams to "punish" the mayor of Fort Lee? Well, the bridge they (allegedly) closed to create traffic was the George Washington Bridge. No matter your political views, the GWB (as its fondly known by New Yorkers) is the busiest motor-vehicle bridge in the world, and the closure was a headache for commuters who already pay the absurd toll of $13 to cross. The original Tacoma Narrows Bridge, better known as "Galloping Gertie" (shown above) was only open for 4 months. The structure succumbed to "aeroelastic flutter", which is a less terrifying way of saying "twisting violently in high winds." 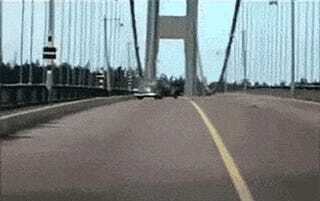 Watching this gif is almost as scary as this train bridge collapse. The new Tacoma Narrows Bridge has been open since 1950, and has been stable ever since. The only thing commuters in Washington have to worry about now is the $5.50 toll, which is only collected one-way on the east-bound side of the bridge. Did you know that there are only 12 toll-collecting tunnels in the United States, and 4 of them are in New York City? Not surprisingly, two of them are tied for the most expensive. Entering Manhattan by the Lincoln or Holland tunnel will set you back $13 cash. Fortunately, the ride back is free. The close runner-up for most expensive toll tunnel is the Anton Anderson Memorial Tunnel in Whittier, Alaska. At 13,300 ft, the AAMT or simply "Whittier Tunnel" as it is sometimes called, is the second longest tunnel in North America. Whittier collects a $12 toll per car one-way, in the east bound direction. The Fort McHenry Tunnel passes 1.5 miles, or 7,920 feet underneath Patapsco River in Maryland. Over 44 million cars pass through the tunnel every year, paying $4 each way. You do the math. Manhattan doubles its population during business days from everyone who commutes for work. To support that amount of traffic, the city has an extensive network of bridges and tunnels. The Brooklyn Battery tunnel connects Brooklyn to the southernmost tip of Manhattan. It's also the longest underwater tunnel in North America. The Queens Midtown tunnel, where Tommy Lee Jones and Will Smith rode upside-down in a Ford Crown Vic in the movie Men In Black, connects Queens and and Midtown. The both carry hefty one-way tolls of $7.50. Although the original purpose of collecting tolls was to pay for the construction and maintenance of the road structure itself, that's no longer the case. The MTA claims that 60% of the revenue from tolls goes towards subsidizing mass transit in New York City. Furthermore, the New Jersey Turnpike collects more revenue from tolls than any other road in North America, nearly $1 Billion dollars in 2012. That's more than the entire cost to build the Fort McHenry tunnel in the 1980's. Think tolls are high now? Wait until autonomous cars start showing up on our roads. Our entire infrastructure will need to be revamped to support V2I (vehicle to infrastructure) before driverless cars can really take off. The new technology is guaranteed to be expensive, driving tolls up even higher. Just one more thing to add to the long list of reasons to be scared of connected cars. Mojo Motors is a website where shoppers Follow used cars and trucks to get alerts when dealers drop prices, sell cars and bring similar vehicles into inventory.